It’s essential for home buyers and sellers to know that almost all real estate transactions can be salvaged when mold is discovered. Buying and selling a home with mold is often much cheaper and simpler than most people would think. The main causes of concern for buyers and sellers of a home with mold is the potential health effects, cost to remove the mold and the possibility of damage caused to the structure of the home. Most mold health effects are either exaggerated or unproven. For example, as of now, and to the best of our knowledge there is no scientific proof that mold exposure has a link to fatal diseases such as cancer. That being said, there can be negative health effects from mold exposure. Generally, people respond to mold the same way they’d respond to other allergenic substances: runny nose, sneezing, congestion, coughing, rash, itchy eyes, and other irritations. It’s best to take care of a mold problem before purchasing your new home, because these symptoms can make you feel horrible. It’s important to note that everyone responds to the presence of mold differently. Some may be very sensitive to mold, while others may have no reaction whatsoever. Infants, children, pregnant women, elderly, and those with existing health conditions may be at the highest risk of having a severe reaction to mold. If mold is discovered during an inspection before a real estate transaction, what is the cost of removal? The answer depends on many different variables. In cases of minor mold problems, you may even be able to do it yourself. For example, if you are a healthy individual, handy with tools, and the contamination area is less than 10 square feet it may be manageable to remove without professional services. 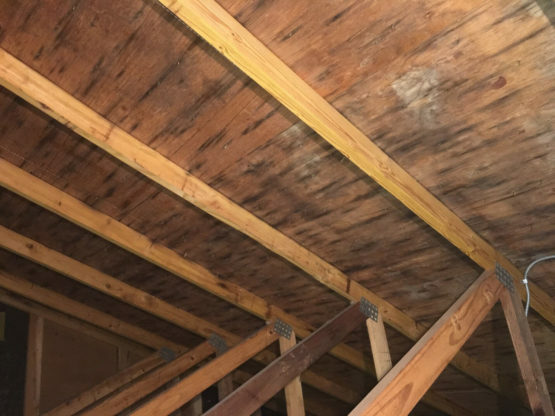 If the location of the mold is in crawl spaces, attics, tight spaces with a contamination area of more than 10 square feet it is recommended to seek professional services for mold removal. Professionals are also more adept at finding and remediating the source of the water presence that is causing the mold. If a mold problem is fixed properly, it won’t suddenly come back years later. But, until the water problem is addressed, mold will likely reappear. Crawlspaces and attics are the most likely spots that an inspector will find mold. This can often catch the parties in the transaction by surprise since it’s a space that may not have been looked at before by the buyer and seller. If you’re a seller it’s best to check these spaces for mold before you list your property, so you can remediate the problem before the sales process. If you are a buyer and mold is discovered during the transaction, it’s recommended to insist that the mold is removed by a professional. Professional mold remediation services are much more likely to properly remove not only the mold, but the source of the problem so it doesn’t return later. How much will this cost? As we stated before, it depends on the severity of the problem, but it could be anywhere from five hundred dollars to a few thousand or more. It’s also important to note that mold disclosure laws vary from state to state. In some states, the seller is obligated to disclose the presence of mold, while others to do not. Make sure to do do you research before buying your new home.